↑ 1.0 1.1 "Azim Premji". Britannica. http://www.britannica.com/EBchecked/topic/710892/Azim-Premji. Retrieved on 26 دسمبر 2013. ↑ 2.0 2.1 "The World's Billionaires No. 83 Azim Premji". Forbes. 3 نومبر 2009. https://web.archive.org/web/20091129090553/http://www.forbes.com/lists/2009/10/billionaires-2009-richest-people_Azim-Premji_1UFS.html. Retrieved on 7 دسمبر 2009. ↑ "Azim Premji – Forbes". Forbes. https://www.forbes.com/profile/azim-premji/. ↑ "What you didn't know about Rishad Premji". Rediff. 7 جون 2007. http://www.rediff.com/getahead/2007/jun/07rishad.htm. Retrieved on 7 دسمبر 2009. ↑ Azim Premji Profile Forbes.com. Retrieved ستمبر 2010. ↑ "The World's Billionaires". Forbes. 3 مارچ 2009. https://web.archive.org/web/20090316053019/http://www.forbes.com/lists/2009/10/billionaires-2009-richest-people_Azim-Premji_1UFS.html. Retrieved on 16 مارچ 2009. ↑ Gates, Bill. (21 اپریل 2011) Azim Premji – The 2011 TIME 100۔ TIME. Retrieved on 12 نومبر 2011. ↑ Karmali, Naazneen. "Azim Premji Donates $2.3 Billion After Signing Giving Pledge". Forbes. https://www.forbes.com/sites/naazneenkarmali/2013/02/23/azim-premji-donates-2-3-billion-after-signing-giving-pledge/#59a8169024cd. ↑ Western Indian Products Ltd incorporated in 1945۔ Churumuri.wordpress.com (2009-07-20)۔ Retrieved on 2015-11-21. ↑ Home Page – Sentinel Technologies, Inc۔ Sentinel.com. Retrieved on 2015-11-21. ↑ Azim Premji Profile – Biography of Azim Premji – Information on Azeem Premji Wipro Technologies۔ Iloveindia.com (24 جولائی 1945)۔ Retrieved on 12 نومبر 2011. ↑ "Azim Premji". Worldofceos.com. http://www.worldofceos.com/dossiers/azim-premji. Retrieved on 26 دسمبر 2013. ↑ "Billionaire Profile: Azim Premji by Mandovi Menon". MENSXP.COM. 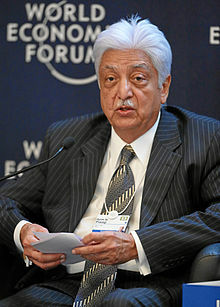 http://www.mensxp.com/work-life/leadership/10244-billionaire-profile-azim-premji.html. Retrieved on 1 اکتوبر 2013. ↑ "Rishad Premji is Wipro's new CSO". The Hindu. 2 ستمبر 2010. https://web.archive.org/web/20100908083431/http://www.thehindubusinessline.com/2010/09/03/stories/2010090352040700.htm. Retrieved on 10 ستمبر 2010.